I know I’m not the only one who loves a good lipstick or fresh set of lashes here and there. Like many young women, I’ve been experimenting with makeup since my late middle school years. It started out as eyeliner, lip liner and roll on lip gloss. Today, it’s a full face beat from top to bottom. I literally went from the dollar section at the local beauty supply or drug store to the MAC counter and Sephora. When I think about the makeup game, all I can say is this: It’s lit! There’s something for everybody and every personality. Personally, I don’t wear makeup everyday. I usually go without unless I’m going somewhere special or it’s the weekend. Since I usually like to wear a full face, it’s hard to do with a full schedule and sometimes I like to give my skin a break. On one hand, there are those women who can “beat their mug” every single day. (Shoutout to you sis!) On the other hand, there are women who barely wear it all. (Shoutout to you, too!) A fresh face and touch of lipstick or maybe just an eyebrow fill and some gloss. Some ladies don’t wear it at all. *kanye shrug* There’s nothing wrong with any of these preferences. Regardless, there’s something for the whitest of whites down to the brownest of browns. With cosmetic lines like MAC, Urban Decay, NYX, Fenty by Rihanna, and a long list of others, there’s a product for every face and every budget. That women wear makeup for men. First of all, makeup has been worn by women AND men for as long as faces have existed. The history of cosmetics spans approximately 6,000 years and is an integral part of every society on earth. It so happens that in today’s society, cosmetics have a whole new face (literally). The one thing that hasn’t changed is that men are still the biggest divas on earth. Not only do they work overtime to make sure that women remain a step down in society (Hello!? Gender equality, anybody? ), but once again they seem to think that everything women do is about them or for their pleasure. 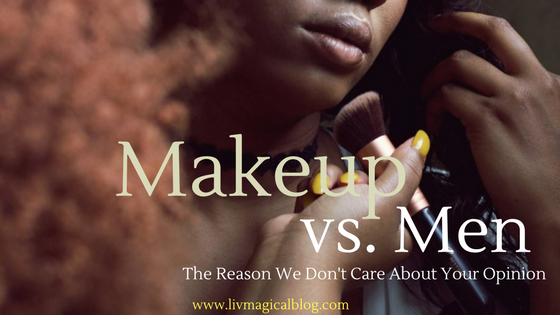 I can only speak for myself when I say I have never worn makeup for the approval of a man. Either you like me or you don’t. I'm lucky enough to have someone who thinks I'm beautiful either way. If I had to guess, most women wear makeup because of how they feel personally when they wear it. It can be a confidence booster and there’s nothing wrong with that. That doesn’t mean that the woman wearing it thinks she’s ugly without it. It’s an accessory of sort, not much different from a fresh set of nails or a new purse. It’s kinda like that black stuff your barber uses to give you a hairline. You don’t have to have it, but you want it because you like the idea of a hairline. Or in some cases, having a beard because it compliments your face better than not having facial hair at all. Men: Not everything a woman does is for you or your attention. I expect the same attention from my boyfriend with or without makeup. It’s not optional. The things we do as women are usually for our own acceptance. Being a woman in this world is a hard job. We are constantly judged (by men and each other). We are constantly held to unrealistic standards of beauty. We are critiqued, criticized, and told what we need to do to be accepted by the likes of those, who only a mother could love. There’s a difference between preference and prejudice. (Some of y’all don’t hold the audacity to have either.) That’s what makes this way of thinking problematic. It can borderline the insinuation that you, as a man or partner, hold some sort of control in your partner’s choice of appearance. It can easily cross a boundary that does not need to be crossed. Bottomline: We like makeup because we like it. Not because we like you. (Half of the time, some of us don’t like you.) It is not a defining factor in our self esteem or self worth. It is not a deciding factor in our standard of beauty. It is not a ploy to get your approval. In other words, f*** your opinion if it borderlines misogyny. It’s great if you think your girl is more beautiful bare faced and natural, but if she likes to wear makeup here and there, that should be cool too. Until next time, stay beat and protect your magic….